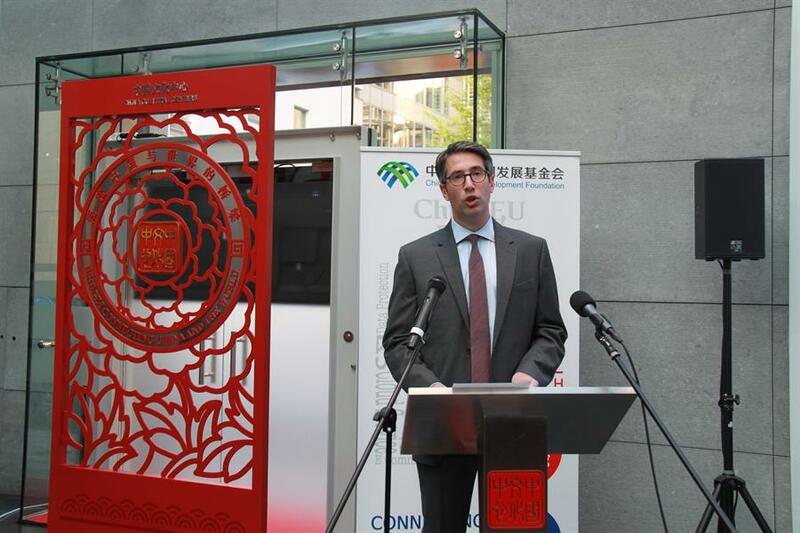 On 25th May, over 200 key players of the EU capital gathered at the China Cultural Centre in Brussels to raise a glass at the first anniversary of ChinaEU. 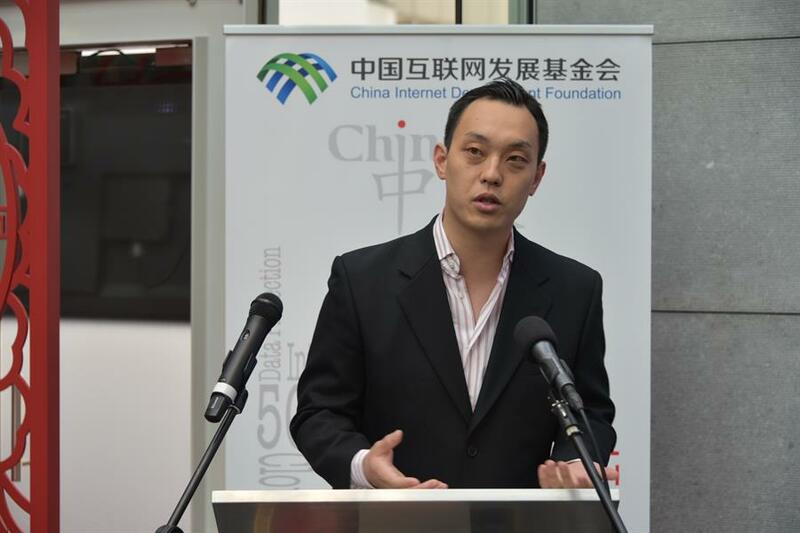 As a young yet passionate organization with an ambitious vision in the digital future, ChinaEU has offered several exciting activities and events to promote digital cooperation as well as to connect digital leaders between China and Europe over the last year. 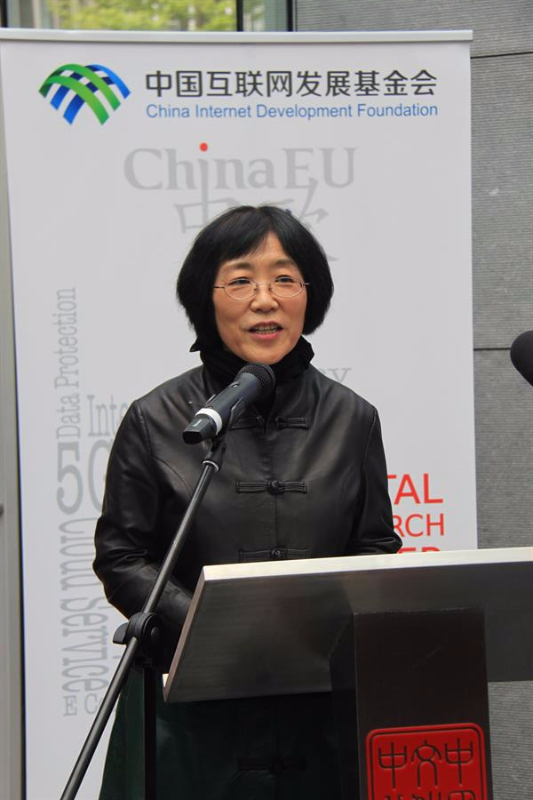 Ambassador Yang Yanyi, Head of the Chinese Mission to the EU quoted a Chinese proverb “cast a brick to invite jade” in her speech to open up the floor. This saying also summarized well ChinaEU’s role in intensifying digital dialogue between China and the EU: the brick being one year of relentless efforts of ChinaEU and the jade being the lucrative opportunities that will result from increased cooperation between EU and Chinese business. 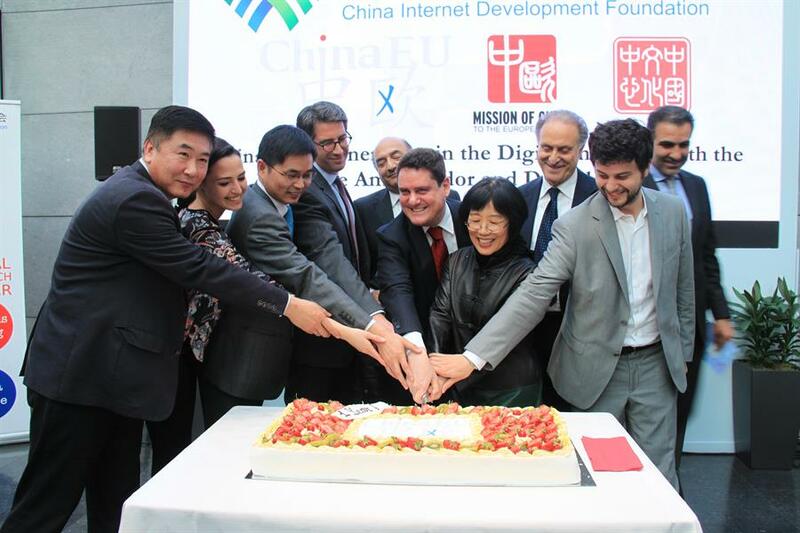 The first anniversary was an opportunity to take stock of the exciting activities launched over the last year and the new projects in the pipeline to promote digital cooperation as well as to connect digital leaders between China and Europe. Entitled “China-EU partnerships in the Digital industry: with the Chinese Ambassador and Digital Leaders”, the One-Year Anniversary event was also a networking evening, bringing together over 20 MEPs with their colleagues and assistants, 40 high-level representatives from European Commission and more than 100 representatives from industries to share and exchange views on challenges and opportunities of building China-EU digital partnerships. Ambassador Yang congratulated the achievements ChinaEU made so far in her keynote speech on China’s cyber economy. She in particular explained the details of the newly released 13th Five Year Plan framework, which untapped huge potential for digital cooperation between China and Europe (to view the full speech, please click here). She said that, given the fact that China is now shifting towards innovative, coordinated, green, open, and shared development with a clear and strong focus on innovation, cyber economy has become a new and promising growth path for the country’s future. To build a digital China will be the main goal of the government in the coming five years, which consists of four concrete tasks, namely to speed up the building of high-speed, mobile, secure and ubiquitous new generation information technology infrastructure; to develop modern internet industrial system; to implement the national big data strategy; and to enhance cyber security. Ambassador Yang stressed that the digital economy has become the most powerful engine to drive China’s economic development, with the growth rate of this sector being five times higher than that of the GDP last year. In addition, the government spares no effort in developing a nationwide Internet system, spending 430 billion RMB (60 billion EURO) in 2015. This number will soar to 700 billion RMB (100 billion EURO) in 2016 and 2017, and an additional 140 billion RMB (20 billion EURO) will be invested in improving rural Internet connectivity until 2020. One undoubted fact is: digital transformation is underway in both China and the EU. Thus the fast development of China’s digital economy should not been seen as a threat but an opportunity which opens more doors to business cooperation between China and Europe. 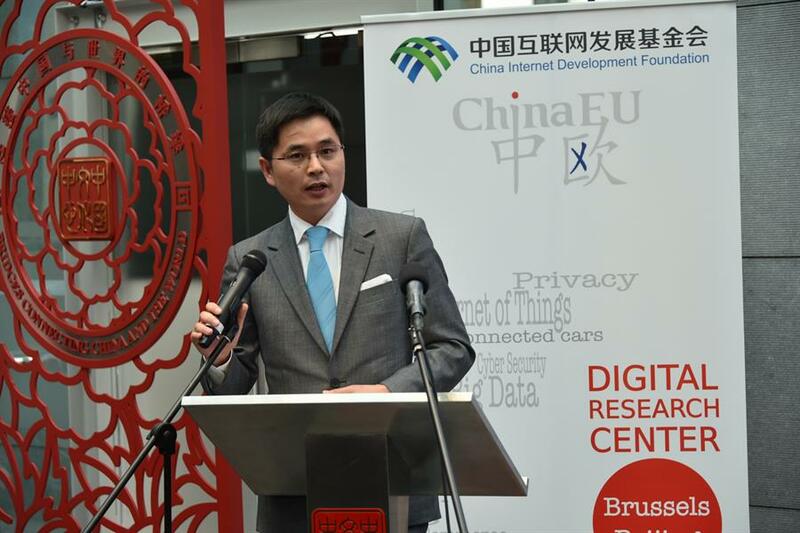 “It has been a shared view of many Chinese and European businesses and enterprises alike that there are many areas of potentially lucrative collaboration between China and Europe, but perhaps none as promising as the digital and telecom markets”, said Ambassador Yang. She suggested that China and Europe should work hand in hand and combine each other’s competitive advantages: innovative technology in Europe and a huge market in China to achieve win-win result. For example, the EU should take advantage of China’s interest in participating in the Investment Plan for Europe, and come up with concrete opportunities for China to invest in it. 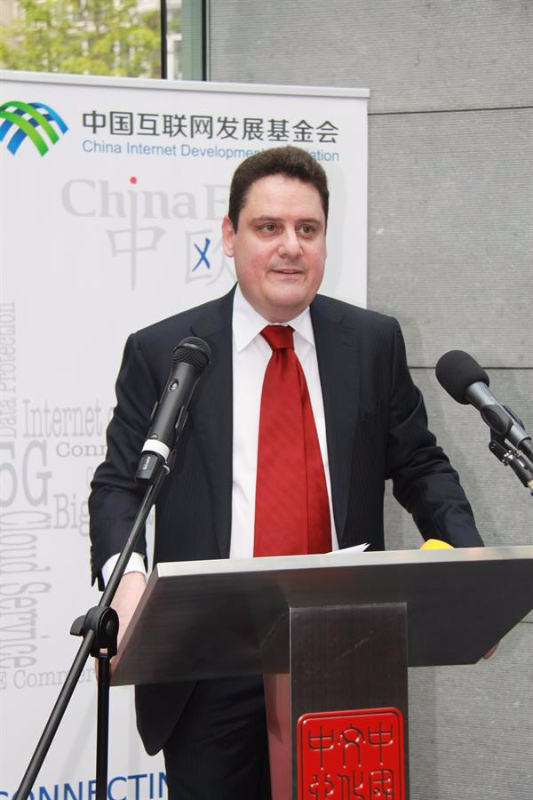 Luigi Gambardella, President of ChinaEU, took the occasion to further strengthen Europeans’ faith in numerous opportunities China could bring, saying that digital is the future and the win-win relationship can be only achieved through cooperation based on mutual trust (to view the full speech, please click here). “Cooperation between Chinese and European companies creates business and employment opportunities. However, ChinaEU aims to achieve more than just business opportunities by bringing together Chinese and Europeans leaders and future digital leaders. ChinaEU wants to bring about cross-insemination of Chinese and European business values”, he said. Luc Tholoniat, Member of Cabinet of President Juncker, European Commission addressed in his speech that Chinese investment is rising in Europe, notably in the digital sector, and strong EU-China cooperation on digital matters are both unique and profound. “We know but too often forget that the EU and China have in fact a very similar approach and a shared ambition on digital matters – and not only because we both use five-year plans in our policy-making. This approach is about promoting technological and digital developments, not just as a goal in themselves, but as a means to meet broader societal and economic challenges”, said Tholoniat. “The EU has a strong interest to build new solutions and to work with China. Just like China has a strong interest to participate in EU research and innovation and access a market of 500 million European consumers”, added he. Tholoniat stressed the importance of building an effective framework for cooperation between China and the EU on digital matters, as part of the broader context of China-EU relations. He also referred to the EU-China Summit, taking place in mid-July this year in Beijing. The development of common standards and joint research in areas such as 5G mobile communications and the “Internet of Things”, building on the dialogue between the European Commission and the Chinese Ministry of Industry and Information Technology (MIIT). Four selected industry representatives provided concrete examples of such cross-inseminations between China and Europe during the event. Xiao Ming, President of ZTE Europe drew on ZTE’s own experience to explain how the big vision of China-Europe cooperation translated into concrete business opportunities. He said that as one of the top three innovative companies in the world, ZTE itself is a good example for a beneficial and successful China-EU digital cooperation. In fact, when a series of terrorist attack happened in Brussels on 22 March this year, the Belgian mobile networks was totally crashed down due to saturation, except for BASE, the mobile network deployed by ZTE. It remained operational throughout this dramatic day, providing stable connections which allowed thousands of people who were lost in fear and worry be able to contact their families. 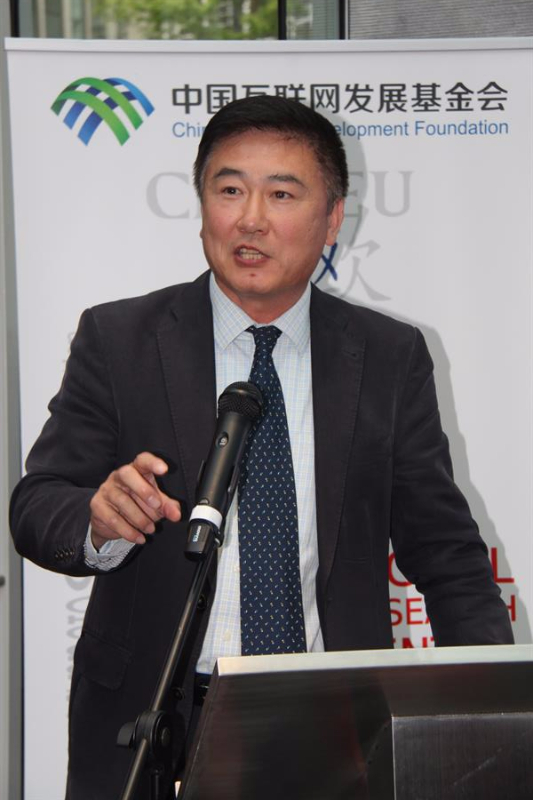 Stuart Oda, Co-Founder & CFO of Alesca Life Technologies Limited, presented his technology, that was already granted international awards, to grow healthy and sustainable vegetable without land and managed through a smart phone. This technology combines advanced monitoring, automation, climate control, and even cold storage capabilities (to watch Alesca Life’s video on YouTube, please click here) and will enable commercial-scale farming anywhere. 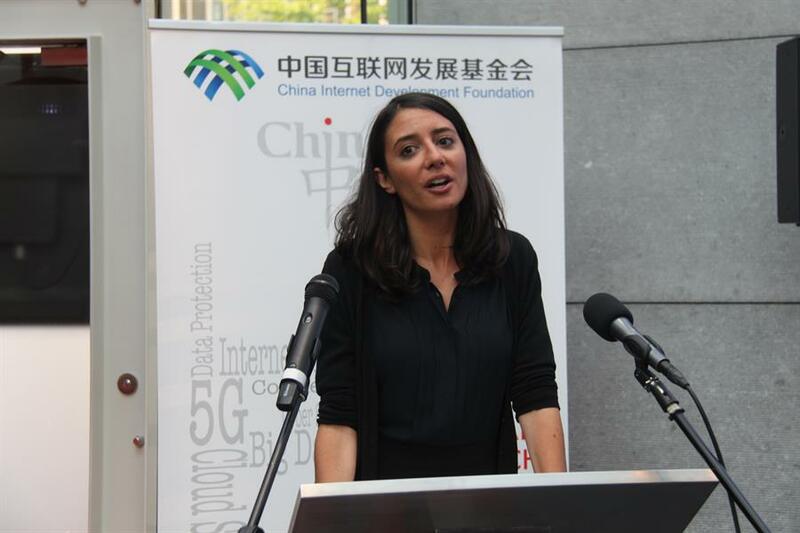 Marine Elgrichi, Head of Public Policy Europe at Spotify stressed the potential of Chinese market and the willingness of Spotify to work with China and ChinaEU. Spotify was the DJ during the event, providing a well-studied selection of Chinese and Western music. Song Zhiwei, Marketing Director of China Belgium Technology Center, shared the exciting project of China Belgium Technology Center, an incubator for technology startups as well as the biggest Chinese FDI investment in Belgium. “Are you ready to join?” asked Luigi Gambardella. ChinaEU is here to help: to help Chinese creators of technology who have now become key partners of the European Telecom operators grow deeper root; to help those who haven’t enter European market yet find their way in; to help European digital enterprises broaden their presence in China; to help startups with all the guidance needed for exploring new markets; and to help establish a transparent as well as efficient database for comparable studies on digital legislations and regulations in China and Europe.